Dermalogica Founder Jane Wurwand was invited to join a select group of entrepreneurs and senior United Nations officials at the UN’s first Global Accelerator Conference to find scalable solutions, hosted by the United Nations Foundation’s Global Entrepreneurs Council and the UN Department of Public Information at UN headquarters in New York. The day-long event, which addressed women’s economic empowerment as one of the central focal points, brought together 100 of the world’s top entrepreneurs to act as policy leaders on several global issues. Wurwand, who also launched Dermalogica’s philanthropic women’s initiative, FITE, participated on a panel that spoke upon women’s financial independence. 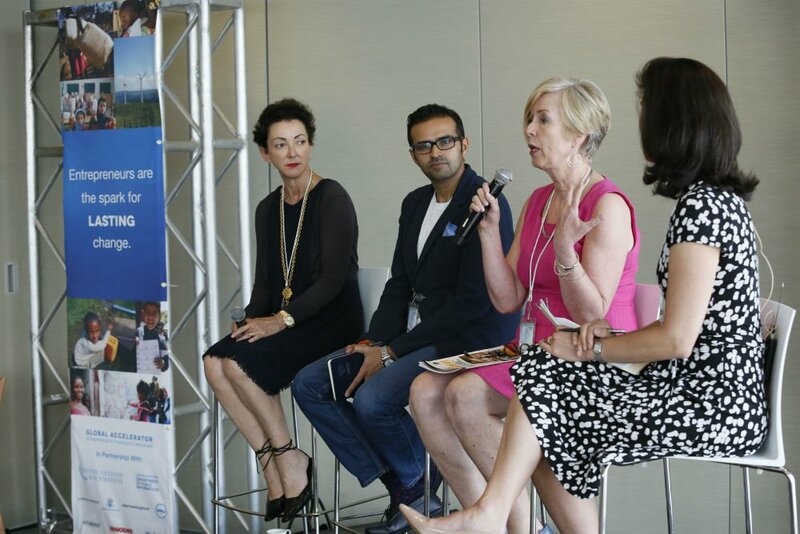 The panel, which was moderated by Rana Foroohar, TIME magazine’s assistant managing editor, included other notable speakers including Kristin Hetle, Director, Strategic Partnerships, UN Women and Ashish Thakkar Founder and Managing Director, Mara Group. The mission of the 2014 Global Accelerator Conference was to bring together a select group of entrepreneurs and high-level UN officials to find scalable solutions to some of the world’s most pressing challenges, and drive progress on Millennium Development Goals (MDGs) to alleviate poverty and save lives. The 2014 Global Accelerator Conference brought together luminaries in media, technology and public policy, including Arianna Huffington, Chair, President, and Editor-in-Chief of the Huffington Post Media Group, Elizabeth Gore, Entrepreneur-in-Residence, United Nations Foundation and Kathy Calvin, President and CEO, United Nations Foundation. For more information on Dermalogica and its philanthropic initiative, FITE, please visit www.joinFITE.org.